I have now have three of these handheld computers, including this latest one which I was able to purchase with a box and a couple of 5.25" disks. Unfortunately I don't have the manual and the box had certainly seen better days though it is still largely intact. 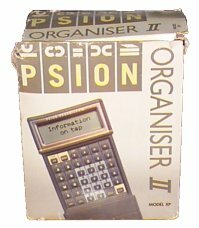 This Organiser II XP does not seem to have had a lot of use and is on good condition. My first encounter with these hand held computers was back in the early 90's when visiting friends of the family who worked on a dairy farm. 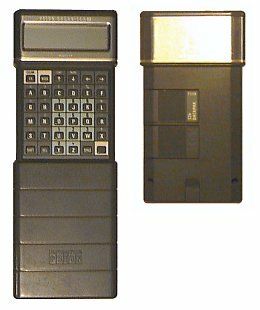 They were using a PSION Organiser II XP with an attachment to measured moisture levels in the ground, the attachment was basically a long metal rod attached to the PSION by a flexible cable that was thrust into the ground. The moisture levels were recorded on the PSION along with the location they were taken in and were then transferred to a PC for use in a farming software program.